Can design thinking challenge the scientific method? Vasant Dhar (NYU Stern School) in BIG DATA 4, 3 (2016), 192-193. The immense problems of the 21st century invite innovative thinking from students, academic researchers, business research managers, and government policy makers. Hopes for raising quality in healthcare delivery, securing community safety, expanding food production, improving environmental sustainability, and much more depend on pervasive application of research solutions. This book (The New ABCs of Research: Achieving Breakthrough Collaborations, Published in April 2016 by Oxford University Press) recognizes the unbounded nature of human creativity, the multiplicative power of teamwork, and the catalytic effects of innovation. Contemporary research teams get a further boost from fresh ways of using the Web, social media, and visual communications tools that amplify collaborations. This book reports on the growing number of initiatives to promote more integrated approaches to research so as to promote their expansion. It is meant as a guide to students and a manifesto for policy makers, challenging widely-held beliefs about how applied innovations evolve and how basic breakthroughs are made. The first guiding principle for research is that applied and basic research combined (ABC Principle) produces better research in both. The second guiding principle is that blending the methods of science, engineering and design (SED Principle) will improve research outcomes. Educational experiences that cover the scientific method, engineering prototyping, and design thinking will enable future researchers to choose whether they conduct controlled experiments, do field studies, or brainstorm with diverse stakeholders. Teamwork is a key theme of this book, but there is always room for the lone technology tinkerers or solitary theorists who passionately pursue their dreams, until they are ready to share with others. However, organizational partnerships and collaborative teamwork appear to accelerate innovation and produce more frequent success stories that reshape education, communities, business, and government. The prevalence of new tools and research strategies means that these higher ambitions can be realized. Web-based libraries, open access publishing, social media engagement, visual communication tools, and other new technologies mean that new opportunities are available to researchers. These technologies, coupled with new research strategies such as citizen science, big data analysis, visual analytics, and rigorous cases studies means that the higher ambitions of research teams can be achieved. Bold ideas and valuable innovations ultimately come from a single individual, but individuals are more likely to create them when working within a team, a well-organized network, and a supportive community. Therefore this book covers the strategies for nurturing individuals, managing teams, weaving networks, and cultivating communities. I absolutely love it all! 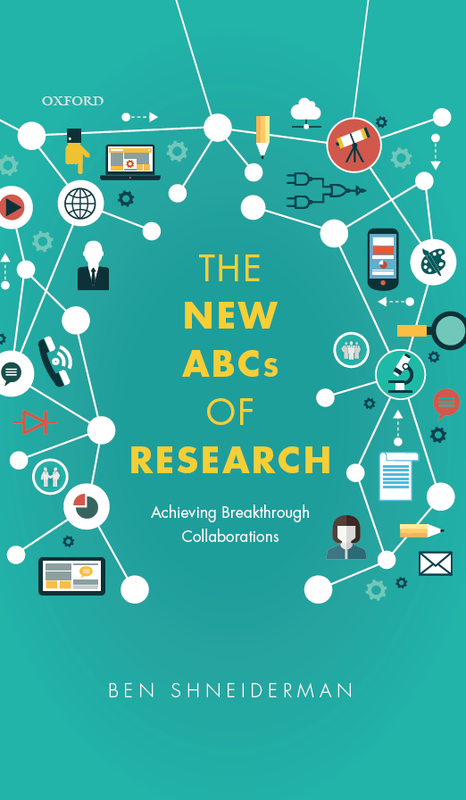 The New ABCs of Research captures, catalogues and advocates for exactly what we need to be doing in research and scholarship at a major research university. It beautifully describes the combination of basic, interdisciplinary, and translational research with partners that is so powerful and so needed. I want to capture it for our strategic plan. This is a must-read book for those of us that want to create radical innovations and breakthrough scientific advances to solve the 'wicked' problems surrounding us in the 21st Century. It also provides valuable advice for policy makers and organizations that fund basic research. It is both inspirational and pragmatic with many examples that illustrate how to achieve a productive bridge between applied and basic research - a bridge that creates a "unity of purpose, which promotes the raised ambition of doing both". To do both we need tools and mindsets that advance deep collaboration and that help us jump epistemic borders. This requires deep listening and more importantly, a sense of humility. -- John Seely Brown, Former Chief Scientist, Xerox Corporation and director of its Palo Alto Research Center (Xerox PARC). Ben Shneiderman's powerful and important new book makes the strong case that we must integrate studies of practical problems with the development of theory: each supports and drives the other. This strong, highly readable book presents well-reasoned arguments combined with powerful case studies. The book especially resonates with me, for as I have made the transition from academia to industry and back again (several times), I have seen how theory can be used for practical problems while practice reveals the gaps and deficiencies in those theories, My current rebirth as a designer is specifically so that i can follow Shneiderman's prescription. Academia has gone too far with its emphasis on theoretical abstraction and discipline silos: It is time to blend engineering, science, social sciences, business, and the arts. -- Don Norman, Prof. and Director, The Design Lab, University of California, San Diego, former Vice President of Apple, and Author of "The Design of Everyday Things"
"The New ABCs of Research" celebrates the way the Web has changed research methods and goals. It's about teamwork, community, and sharing. It's about making a better society and better lives for everyone. It's about passion, hard work, and hope. It's what we need for the next hundred years. Increasingly, the breakthroughs in research that contribute to solving the hardest problems in our world rely on collaborations among teams of experts from different disciplines. Shneiderman's new book examines how to make such collaborative research ventures productive. He builds on two key foundational principles: the importance of combining applied and basic research and the role of science, engineering and design as a tools and methodologies. Building on these two principles, he illustrates the approach with further elaboration and a host of case studies from industrial research to academia to government. This book will be compelling reading for anyone thinking about building an effective research organization for the 21st century. It's excellent... a critically important research manifesto in the spirit of Vannevar Bush's 1945 Science: The Endless Frontier. Ben Shneiderman's New ABCs of Research presents a compelling, evenhanded argument for a new paradigm for interdisciplinary collaboration that puts engineering and design on an equal footing with basic science. This well-written book is full of sound observations and sage advice for students and young researchers alike, while at the same time providing plenty of food for thought for established researchers and policy makers. Innovation powers economic growth. But how to achieve true breakthrough innovations? Ben Shneiderman's The New ABCs of Research explodes the myth that innovation is the product of lone inventors and shows how the key lies in collaboration and conducting applied and basic research together. It's a must read for those who are looking to spur innovation in the academic, corporate, startup and urban innovation communities. I am in complete harmony with the theme presented. I have no doubt about the accelerated progress gained by connecting the most fundamental thinking to potential applications. Very often the big hit applications turn out to be something not initially considered but the back and forth between utility and understanding stimulates the expanding visions that fuel all avenues. Shneiderman's message distills key learnings from the last three decades of academic research and commercial innovation. His prescription for integrated and iterative applied and basic research should be read by every student, faculty member, university president, and funding agency lead. Real breakthroughs come when applied and basic research resonate and collide. Then science, engineering, and design team up to speed the flow of innovation. Shneiderman's new book shows how. 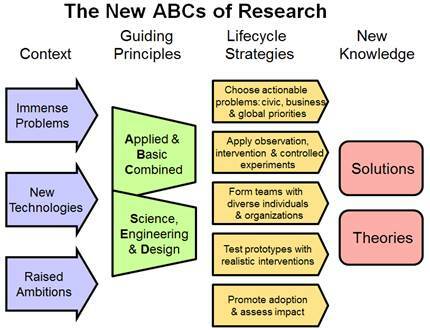 The New ABC's of Research is a brilliant synthesis about the creation of knowledge that matters. It does for Applied/Basic Research & for Science/Engineering/Design what CP Snow did for Science/Humanities in The Two Cultures and the Scientific Revolution. The content is rich and thoughtful, the writing is crystalline in its clarity, and the chapters on Science, Engineering, and Design are each one worth the price of admission. By using captivating case vignettes to illustrate, the book expresses its own message of working in both theory and practice. I love this book.